Another migrant, Frank Martinez, had a similar plan. 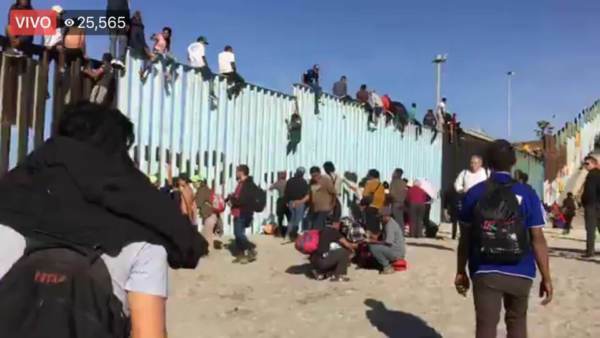 Gateway Pundit Poll: Should Trump Use Military Force On The Border If Necessary? Though the migrants were offered asylum in Mexico, they have no plans to take them up on their offer. Instead, they hope to storm the border to the US. “It’s not my intention, to stay here, in this country. My intention is the United States,” Martinez said. “The best day to go to the bridge—peacefully, not with violence—is on Sunday. And write banners with our points — and we don’t want the media to publish this before we do it,” the leader is heard saying. President Trump said that he has no intention of allowing the invading mob into the country, even if that means closing the US border. “If for any reason it becomes necessary, we will CLOSE our Southern Border. There is no way that the United States will, after decades of abuse, put up with this costly and dangerous situation anymore!” Trump tweeted on Saturday.